Creating an environment of integrity within the classroom truly takes a village. Faculty, administrators, and students all play a role in maintaining an ethical campus community. This workshop will explore preventative tools to address classroom roadblocks. 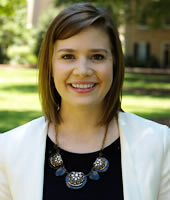 Erin Kitchell is the Director of Academic Integrity in the Office of Student Conduct and Academic Integrity at the University of South Carolina. Erin has worked at USC professionally for seven years, serving in several roles in the Office of Student Conduct, most recently as Director. Erin works with faculty, staff and students to develop a culture of integrity through outreach prevention, education and upholding the Honor Code through the academic integrity process. Additionally, Erin teaches a section of University 101.